16 Apr 2013, when the participants of Boston Marathon , world oldest marathon, were reaching the finish line , 2 bombs exploded with 30 sec difference and nearly 70 yards apart from each other .after 9/11 , this is the single biggest attack on American people in their homeland.people all around the world and Americans themselves are not clear what had happened and how did it happen though American have enforced stringent rules and security after 9/11. "Make no mistake we will get to the bottom of this and we will find out who did this and we will find out why they did this. Any responsible groups will feel the full weight of justice. Its is reported that 3 people died and nearly 100 people suffered injuries in these explosion .The investigation has started and people have been questioned about the incident .A Saudi national has been suspected , but nothing can be said confirmative . "Investigators have a suspect — a Saudi Arabian national — in the horrific Boston Marathon bombings, The Post has learned.Law enforcement sources said the 20-year-old suspect was under guard at an undisclosed Boston hospital.It was not immediately clear why the man was hospitalized and whether he was injured in the attack or in his apprehension. 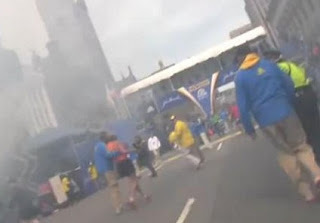 The man was caught less than two hours after the 2:50 p.m. bombing on the finish line of the race, in the heart of Boston."